Fans from all over the world were hoping that some Star Wars 9 footage, or even just the title, were going to debut during the Super Bowl. 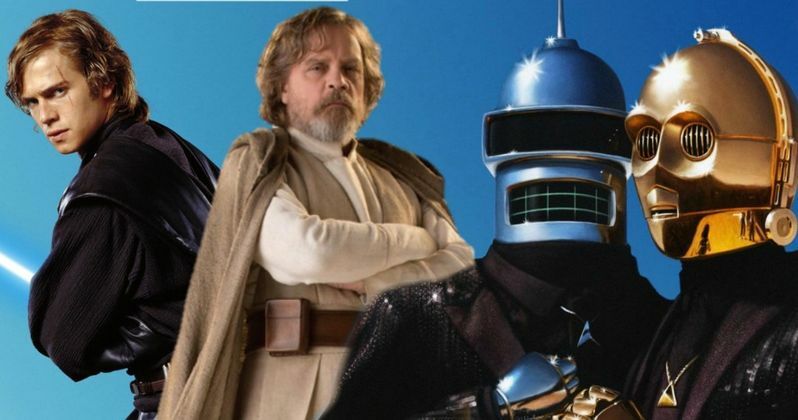 That ended up not being the case, but Luke Skywalker actor Mark Hamill teased fans over the weekend about the title, claiming that Futurama predicted it years ago. Matt Groening, who created the hit animated show, also created The Simpsons, who have been known to predict real-life events over the years, which is what Hamill is referring to. Mark Hamill is pretty much an expert level troll online when it comes to dealing with Star Wars fans. He's obviously having a bit of fun with the fandom, but he recognizes some over-the-top behavior when he sees it. That's why he sent out a tweet to the world that handled the Star Wars 9 title. He had this to say. "Disappointed there was no Star Wars trailer shown during the Super Bowl? Agonizing over how long you'll have to wait until they drop the title? RELAX nerds! Futurama predicted it years ago & we all know: Cartoons. Never. Lie. EXCLUSIVE BREAKING NEWS: Episode X Yoda's Bar Mitzvah." Mark Hamill, who has been a guest voice on Futurama is referring to an episode from the second season titled, The Lesser of Two Evils. In the episode we see main characters Fry, Leela, and Bender visit a theme park called Past-O-Rama, which is made to look like the 20th century. The trio ends up walking past a movie theater that is advertising Star Wars 9: Yoda's Bar Mitzvah on the marquee. Yoda's Bar Mitzvah would actually be a pretty great title for Star Wars 9, but J.J. Abrams has probably cooked up something a little different. As for The Simpsons, the hit show has written some things that have ended up coming true over the years. One of which was the Siegfried and Roy tiger attack, which was in the show in 1993 and then really happened in 2003. Faulty voter machines were introduced to the hit show in 2008, only to become a reality in 2012. In the episode, Homer tries to vote for Barrack Obama, but the machine keeps switching to John McCain. In 2012, it really happened, only it was defaulting to Mitt Romney. Out of everything that The Simpsons have gotten right, two of them standout the most. First is the FIFA corruption scandal, which they predicted in 2014 and then it really happened in 2015. The most memorable would have to be the Donald Trump presidency. The show predicted that way back in 2000, only for it to really happen 16 years later. And The Simpsons did predict Disney buying Fox years before that happened. Mark Hamill took these events into account when crafting his Star Wars 9 title tweet and many fans are still laughing about it. You can read the big title reveal below, thanks to Mark Hamill's Twitter account.